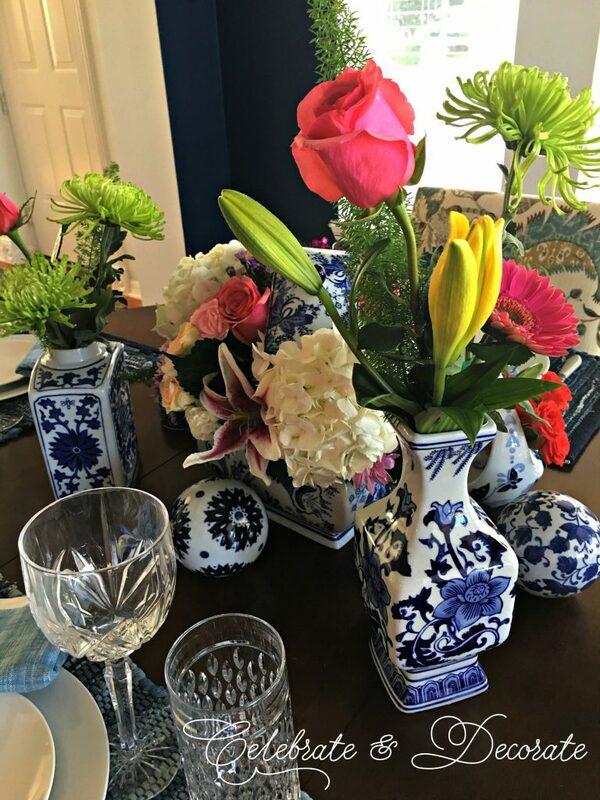 When I am not styling my dining room table, it is home to my dear husband’s collection of blue and white Chinoiserie porcelain. 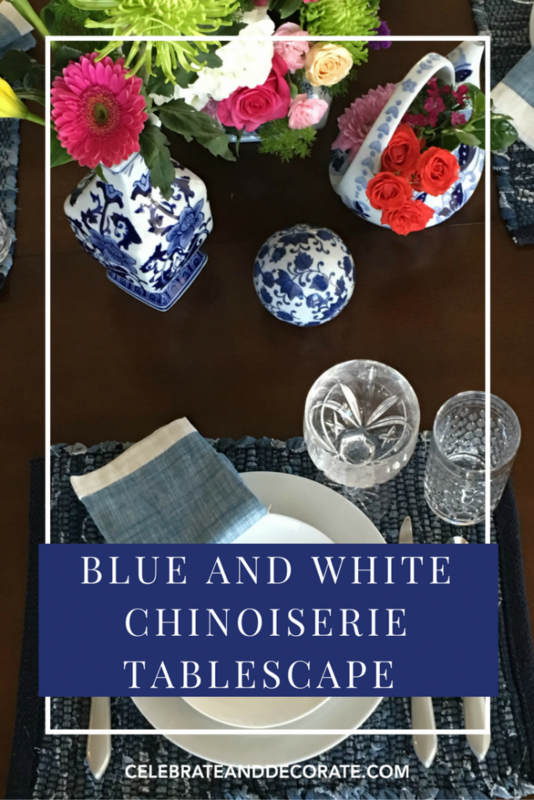 A blue and white tablescape seemed like the perfect way to incorporate the porcelain with a more casual table in the dining room. 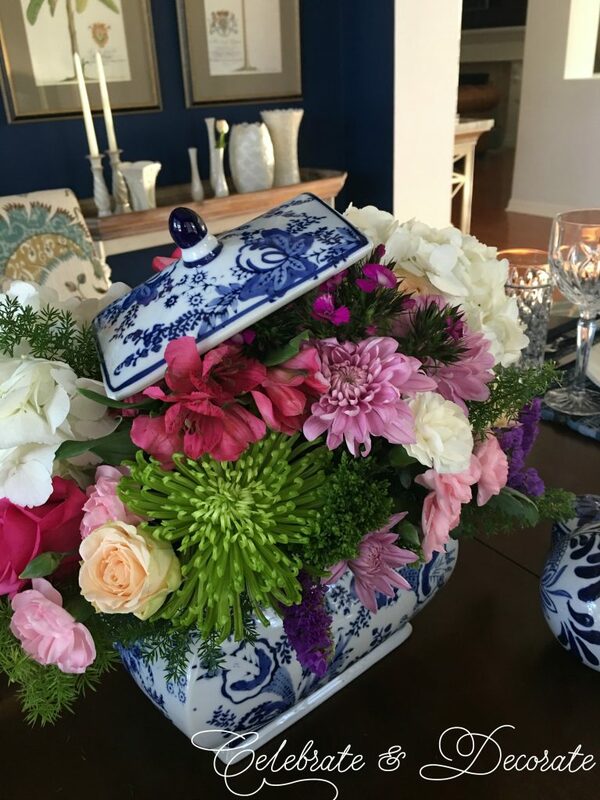 I selected some of the pieces to put flowers in, flowers in a variety of colors to add a punch of color to the table. 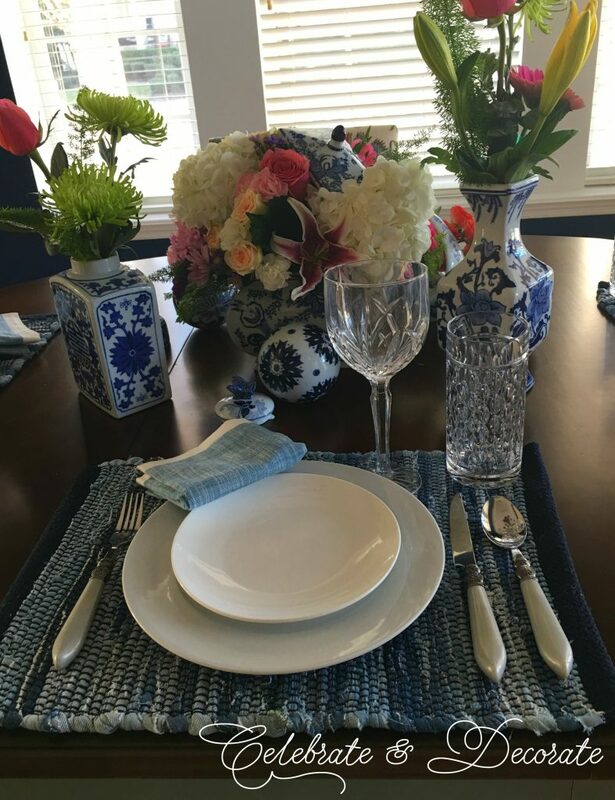 The rest of the table was set fairly simply, with blue and white placemats, simple white dinner plates topped with white salad plates. The star of the table was certainly the flowers arranged in the porcelains. The flatware I selected was my Pioneer Woman Cowgirl lace pattern with pearlized handles. The goblets are my standby favorites, Marquis by Waterford, Brookside pattern from Amazon. I love filling a box with flowers and propping the the lid atop of the flowers. 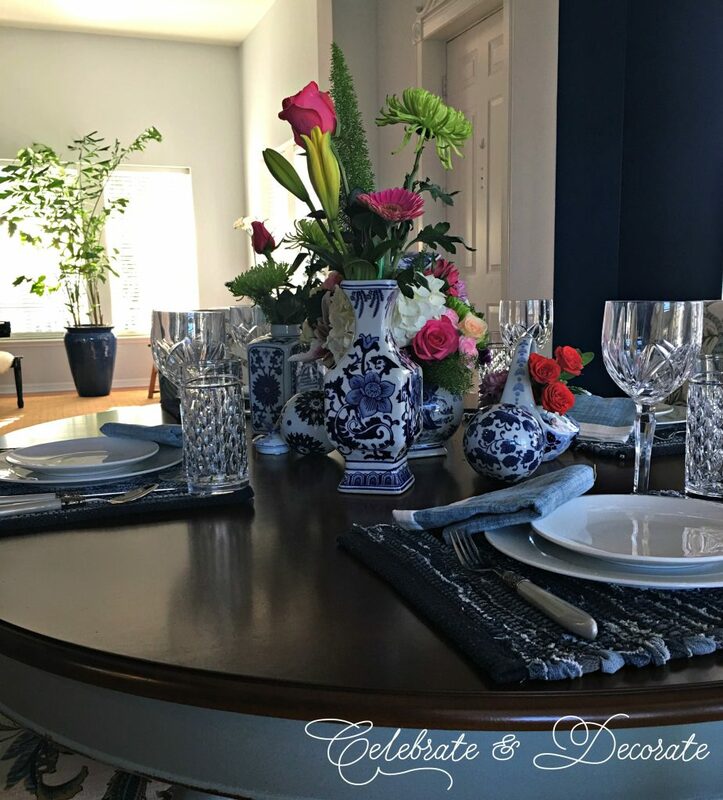 A blue and white tablescape is perfect in my dining room with my dark blue walls and the blue base on my table. A casual setting at dining table is a nice change or some of the more elegant and fancy tablescapes, since it is the right size table for two or four versus our big farmhouse table in the Tavern Room. Enjoy the flowers until Spring officially arrives! That is a lovely table for everyday. Hi Chloe, very pretty table setting. I am horrible at setting tables and always admire pics like this! Hope you had a wonderful V-day! Oh, Christine, I am sure you could set a lovely table, I am glad I provide some inspiration! Just beautiful! You have some lovely pieces, thanks for sharing! Thank you so much for your kind comment Naomie! Chloe this is so pretty! 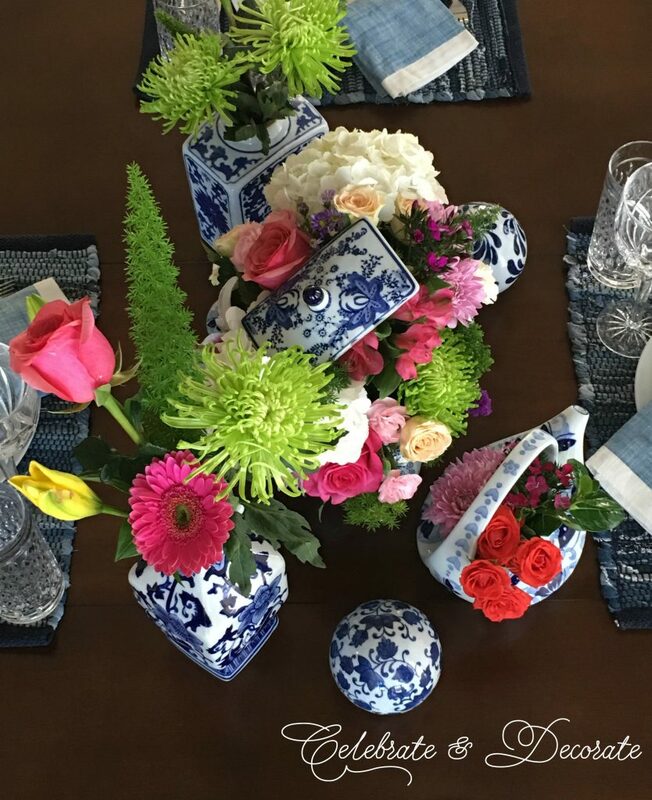 I love the colorful flowers mixed with the porcelain blue and white pieces. Thank you Liz! I thought the bright colors would spread the message that Spring is coming! Oh this is so pretty Chloe!! Love the propped lid! 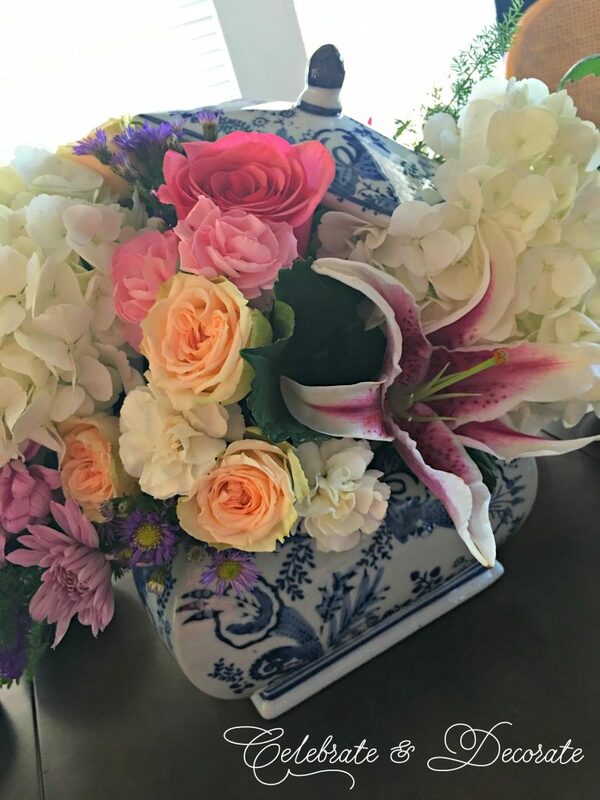 The colorful flowers are just gorgeous with the blue and white! You have made me want to run to the florist and set a table! Thank you so much Jenna! All of those flowers came from my grocery store, too! 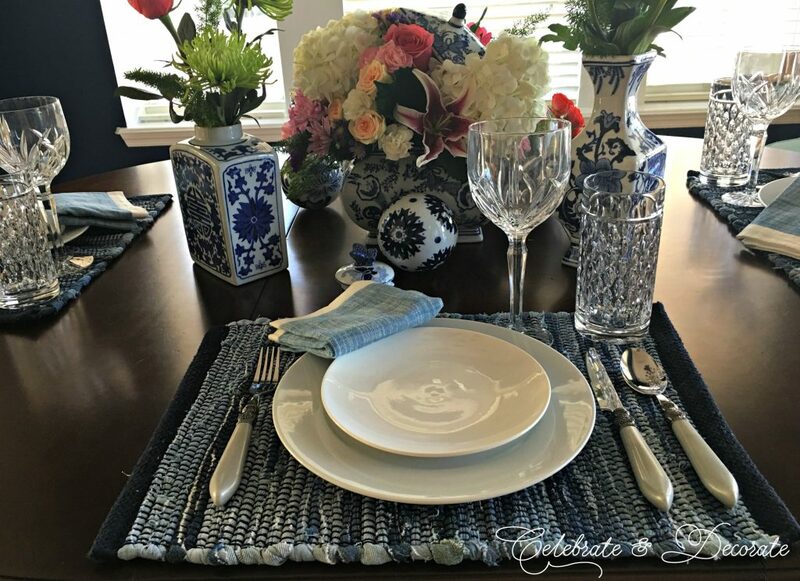 Chloe, you know I love my blue and white, and your table is simply gorgeous! I love the way you placed the flowers in various containers. It adds such drama to your pretty table. I especially adore the way your filled the box with flowers..adorable! I have the same flatware as you in green, and plan on using it this Spring. I hope that you have a beautiful day, sweet friend!!! Oh, thank you Shannon! I am working hard at my craft room/office today! Thanks you so much Donna! I appreciate you taking the time to stop by Celebrate and Decorate and to leave me feedback! Thank you for pinning! 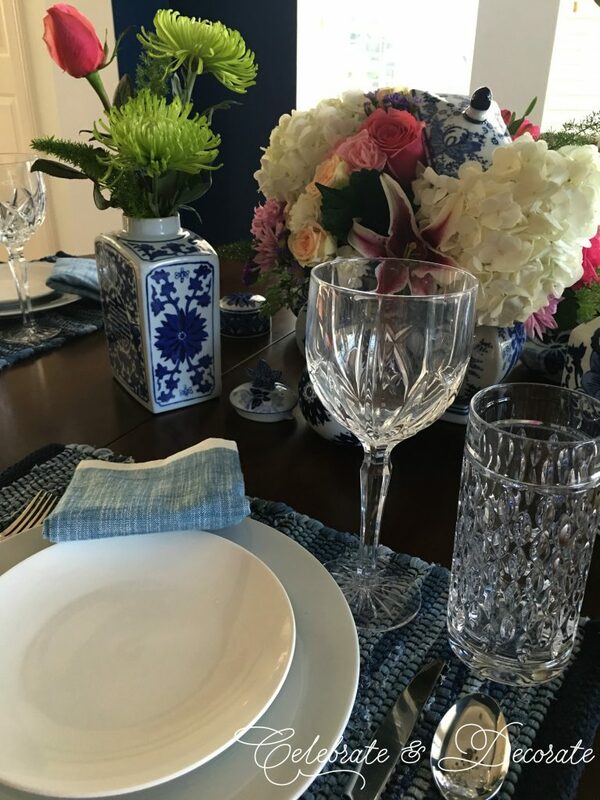 Chloe, blue and white sets such s gorgeous table. Love your husband’s collection! Gorgeous flowers! I adore chinoiserie and have quite a lot of it. It is a weakness of mine. 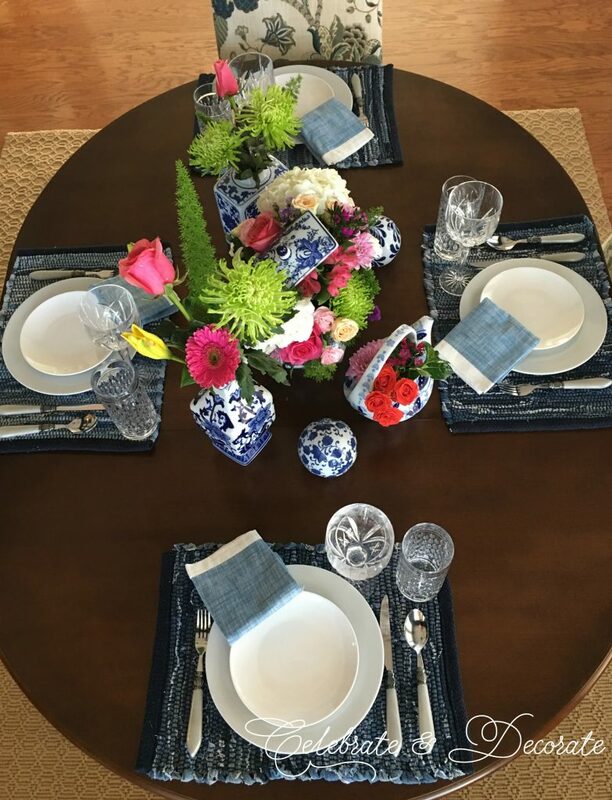 A very pretty table with the beautiful blue and white collection. A beautifully decorated table. So pretty! Your / His collection is beautiful.